As Japan's numerical control (NC) machinery developed rapidly during the 1970s, the NC Tape Checker appeared on the scene. 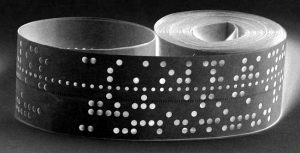 At the time, NC data was recorded on paper tape, which is why it was referred to as a tape checker. 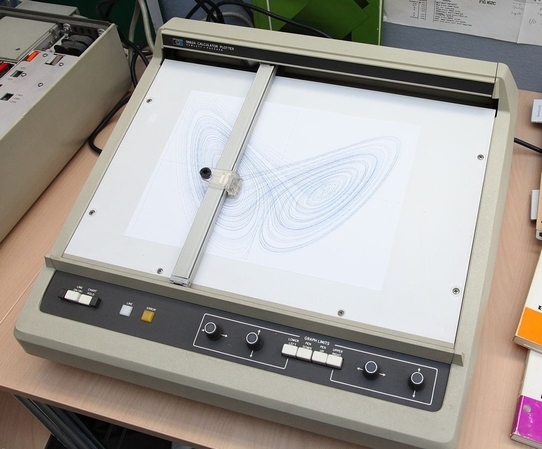 Since neither graphic display or plotters were in wide use yet, there was no way to display the tool trajectory, and operators were limited to formating, operating range, spindle ON/OFF, cooling material ON/OFF and other grammatical checks. Even so, these checks effectively prevented stop alarms on actual machines. Operators soon began to deploy XY plotters that drew tool trajectories on paper. 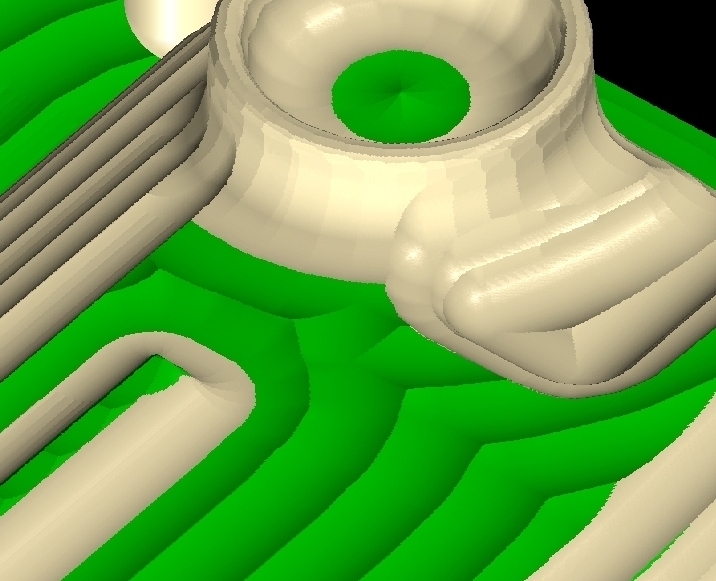 This advancement meant that errors in tool movement could now be visually confirmed. A visible tool trajectory was a breakthrough in the ability to detect grossly erroneous tool movement, but this advancement now required the task of drawing multiple sheets, such as XY planar drawings, YZ planar drawings, and isometric drawings, to compare visually. Doing so requires an operator envision three-dimensional movement in his or her mind, and unless he or she observes carefully and works patiently errors will be overlooked. The advent of Engineering Workstation Graphics (EWS) and UNIX then made use of graphics possible. Virtually cut shapes could now be displayed on a solid screen. The capability of finding defects in NC data by simply viewing a screen, the cutting solid screen, was ground-breaking. The verification process until that time entailed viewing the tool trajectory, and envisioning the shape that the tool chiseled in your mind to validate whether there are any defects, so this new screen was truly revolutionary. But the era of EWS cutting simulator was not a long one: once PC OS Windows 3.1 was released and succeeded by Windows 95 in 1995, industry made a rapid change to PC version cutting simulators. In 1995, the emergence of Windows 95 prompted a sudden shift in simulator platform to the PC. When the PC became the platform, cutting simulator system prices dropped drastically, accelerating widespread adoption of cutting simulators. Once NC data error causes an interference accident to occur, the re-machining, repair, delivery delays and lengthy machine idle time add up to major operations losses. It is clear how effective the introduction of a cutting simulator is in terms of factory operation as well. The term "simulation" means "a mock," so the true definition of a cutting simulator may be correctly defined as a mock representation on a computer of cutting only. 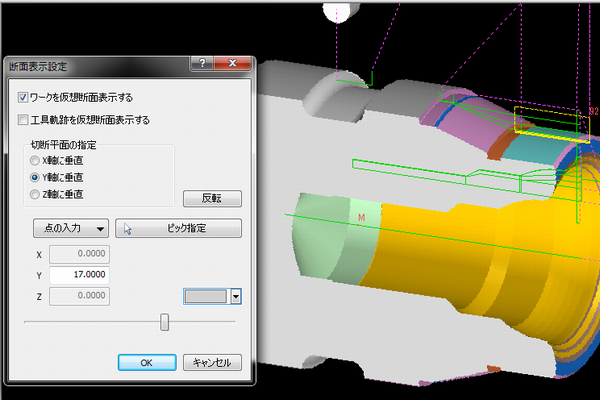 However, the metal machining shops have requested a number of capabilities for the cutting simulator. 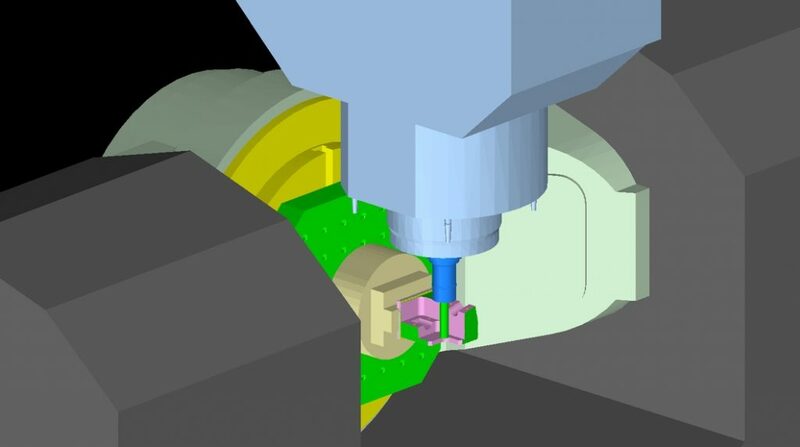 The simulator has continuously evolved with the addition of "interference detection," "tool protrusion length calculation," "model comparison," "hole machining check," "optimized machining conditions," among many other CAE capabilities Cimple Technology implemented. The product is overloaded with features, in the best sense of the word. And we will continue to expand simulator capabilities. 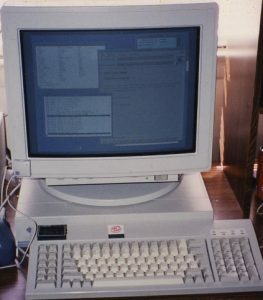 The PC is equipped with a high-performance graphics board and dramatically improved capability to generate computer graphics images. 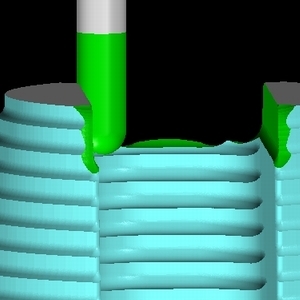 These advancements make machine simulation possible. Operating the machine structure to move the workpiece, jigs, table, and added axes allows you to monitor any mutual interference. Interference among structures becomes a problem for large gate-type machine centers that use attachments. 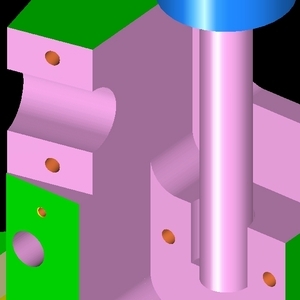 When machining the inside of larger workpieces, added axes and attachments can collide with the workpiece and 5-axis heads can interfere, and the machine simulator detects such interference. Simulators are also called virtual machine simulators. *NCVIEW VM options are used for machine simulation images.